Hire the Clubhouse - click here for more information. Welcome to the website of Eastleigh Rugby Football Club. 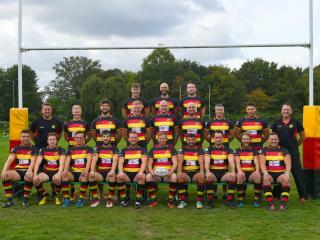 We are a Rugby Union club in Eastleigh, near Southampton, Hampshire that is England Rugby accredited. We welcome players of all abilities and have some of the finest facilities in Hampshire. Please use the links above to find your way around. Players Wanted for the 2018/2019 season in London League 2 SW.
From 6 Six to Sixty(ish). Whether you live in the Eastleigh Borough or not, it doesn't matter! Are you finding it hard to get into the local football team or maybe you have two left feet and want to try a new sport! Maybe, you just want to come along to make new friends and keep fit! Come and have a go at the ultimate team sport of Rugby Union! Enjoy the social side as well as the playing side of the Game. All standards welcome as long as you have the willingness to learn. But please leave your egos and attitudes at home! The main aim of this site will be to increase the profile and development of the sport of Rugby in Eastleigh and the surrounding areas in Hampshire. Also while doing this we would like to demonstrate our excellence in the caring, growth and development of the youth sport in our community. We will also incorporate our core values of :- Integrity, Quality, Professionalism, Trust and Teamwork, in everything we do with the focus on "One Club One Vision". Senior training takes place every Tuesday and Thursday at 7.00pm throughout the season, at the Clubhouse. New players welcome, just turn up on the night. Junior training is organised by the individual squad Coaches and Managers, so check with them first. Rugby has been said to be the ultimate team game – it can be fast, fluid and physically hard. It tests and hopefully advances the personal attributes of all involved – continually. At Eastleigh RFC we measure success by the personal improvement of the individual and collectively, the squad and the Club. Winning is a hopeful consequence but not everything. The relationship between everyone involved in Eastleigh RFC is critical to the clubs well being. RESPECT for oneself and each other is central to the ethos of Eastleigh RFC The club is proud of this approach and is determined to uphold this! In particular, the player's code is based on RESPECT for their fellow players, coachs, referees and opponents. In return, they should expect respect for their personal efforts and achievements. If individuals cannot show this respect then their involvement in the club should be questioned.